On Tuesday, voters flocked to the polls to determine the balance of power in Congress. Meanwhile, the race to determine the balance of power in the eastern division of the NFC conference is also heating up. With two months to go, two of the four “candidates” are locked in a virtual dead heat, while a third’s poll numbers have been slipping as of late. The fourth candidate, from the NY/NJ/CT district, is so far behind in the polls that they have already conceded defeat in this election, and are formulating a strategy to regroup and energize their “base” in order to have a better showing next year. In Congress, the political party of the President usually does not fare well in mid-term elections, losing an average of 30 House seats since World War II (the President’s party lost approx. 35 this year, which falls right in line with historical trends). In the NFC East, being the “incumbent” does not fare well either, as there has not been a repeat champion in the division since the Eagles of the Philadelphia district won four straight elections from 2001-2004. With half of their season still left, the Birds are hoping to buck that trend and get into the playoffs as a division winner, though they are too far behind in the “bye/homefield advantage” poll to end up as a #1 or #2 seed. In addition, the Birds schedule does not help their cause. While the Redskins remaining eight games feature only one opponent that currently has a winning record, the Eagles have two road games left against the top two teams in their conference (the Saints & Rams) as well as the Houston Texans at home in late December, which may not be as easy as it once looked. Assuming the Eagles lose on the road against the Saints & Rams, they would have to win their six remaining games just to go 10-6, which, with the exception of the Texans game, are all against divisional foes (two each against the Redskins & Cowboys, one against the Giants). If they were to win five of those six, they would end up at 9-7, which may or may not be enough to win the NFC East. In such a scenario, they would probably have to sweep the Redskins to win the division with only nine wins. While the Eagles defense was criticized in their close losses (giving up two long 4th down conversions which resulted in the team being 6-2 instead of 4-4 will do that), the defense is not playing any worse than last season when it comes to points scored against them. It’s actually the offense that has regressed. Last season, the Birds averaged 30.5 points/game (excluding the last regular season game, in which they had nothing to play for). This season, the team is averaging only 22.3 points/game, which represents a significant drop of more than 8 points/game from last year. With the exception of the Giants game, they have not scored 30 or more points all season, something that they did nine times in 2017. The arrival of Golden Tate from Detroit in a trade should help those anemic offensive numbers somewhat. Tate has averaged 93 catches per season over the last four years, and his presence on the field should help to open up the ball to other pass catchers as well. The injury bug continues to plague the Birds, however. Darren Sproles, who seems to have the longest nagging hamstring in the history of the NFL, is out once again, and injuries in the secondary to cornerbacks Jalen Mills & Sidney Jones won’t help matters either. Interestingly enough, this will actually be the first relevant Eagles – Cowboys contest at home in three years. Both in 2016 & 2017, they faced each other on the last week of the season, in a game that was irrelevant to both teams. In ’16, the Cowboys had already clinched home field advantage and were using the game to get Tony Romo back up to speed after recovering from injury. The Birds won that game and finished up their season 7-9, heading into the offseason with questions about whether their coach, Doug Pederson, was NFL quality caliber. We all know how that turned out. In ’17, it was the Cowboys playing out the string and winning the game, while the Eagles were using it to figure out whether Nick Foles was good enough to get them through the playoffs and to their first Super Bowl title in team history. We all know how that turned out. Dallas is in a more precarious position than the Birds are. 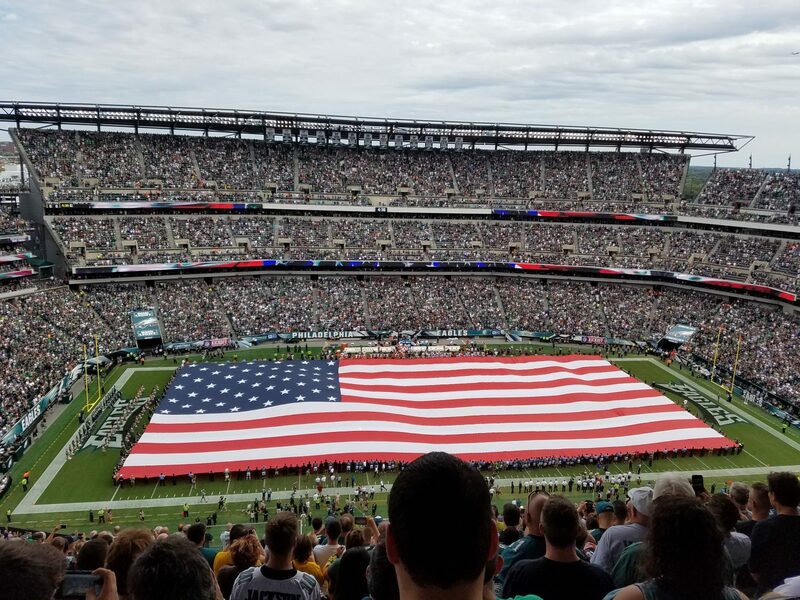 They lost at home to Tennessee last Monday night, and come to the Linc on a short week and on a short lifeline, with a record of 3-5 on the season. But while the Cowboys have been struggling this season, they are still hated in these parts with that stupid “America’s Team” label, which really needs to change to “America’s Mediocre Team”, being that they haven’t been relevant for most of this century. Being a Sunday night game, the crowd will have had all day to feast on tailgate food and drink, and thus, will be thrusting for blood by the time the 8:20 PM kickoff rolls around. I expect the Eagles to come out looking much better on offense, and with the addition of Golden Tate, to win this game, 34-20. I also predict that the stoic, confused look on Jerry Jones’s face will be shown often on national television, with the Sunday night broadcast team of Al Michaels and Cris Collinsworth continuing to kiss his “gluteus maximus” instead of being critical of his football decisions in any aspect.